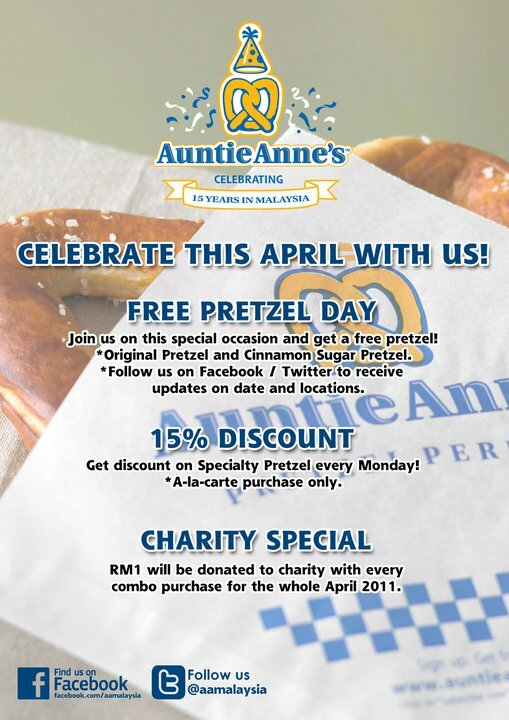 For those who know and have been patronizing the very own and evergreen pretzel specialist Auntie Anne’s, here comes the long awaited reward for its 15th Anniversary this April, once again, nation wide! There will be 2,000 free pretzels up for grabs tomorrow 5th Apr, be there from 11am-2pm 10am-12pm! - Sunway Pyramid (LG2.37A, Lower Level 2,? P.S. Don’t forget to enjoy 15% on Mondays and RM1 charity with combo purchased. This entry was posted on Monday, April 4th, 2011 at 4:54 pm	and is filed under Bakery, Food Promo, Heavenly Klang Valley Food. You can follow any responses to this entry through the RSS 2.0 feed. You can leave a response, or trackback from your own site.